The neighborhood and community police listservs have been abuzz with a report of a home invasion that occurred Monday evening the 25th on the 1200 block of W Street NW. Commander Jacob Kishter of MPD 3rd District confirmed the details of the crime. The three assailants then were able to enter the residence. The suspects were armed with guns and forced the three residents onto the floor. They stole numerous items from the home, and took the victims’ cell phones before ripping out the home’s land lines. The suspects are two African American males and one African American female, all armed. The three victims were not seriously harmed. MPD 3rd District is investigating the crime. If you have any information or leads about the Monday night incident on W Street, contact MPD by calling 202-727-9099 or 888-919-CRIME, or text 50411. This is one of the more depressing Crimes of Notes posts that I have done in some time, especially in terms of robberies and stolen autos. The only silver lining in the crimes noted below is that only two were gun crimes. Of late there have been an increase of street robberies around the DC Metro area, PSA 208 nor the Second District is immune from these. There is not a specific suspect lookout but there is a very specific target, the iPhone. To help combat this problem we are asking the users of all phones and PDAs to use good street sense and be completely aware of their surroundings. In other words, people, it is a bad idea to chatter away on your cell phone (especially an iPhone, it seems)… totally unaware of your surroundings… particularly at night… and especially when you are by yourself on a quiet street. However, a number of these crimes occurred in relatively busy areas, including 15th and P NW last evening at 7:06 p.m. (more details below the fold). Following are crimes of note–robberies, assaults, burglaries and stolen autos–that occurred between January 16 and January 25. There was also a hit and run of a pedestrian early on Sunday morning at 14th and U NW. First, there were records. Then there were the 8-Track and cassette tapes. Next came CDs. Now music is digital. So, who would open a record shop in 2006 and make a go out of it? And who buys vinyl now? It’s dead, right? Wrong. The store is Som Records on 14th Street and the owner is Neal Becton. (Som is Portuguese for sound.) After a string of amazingly diverse jobs around the globe, he worked for The Washington Post for 10 years as an editorial aide in the newsroom. 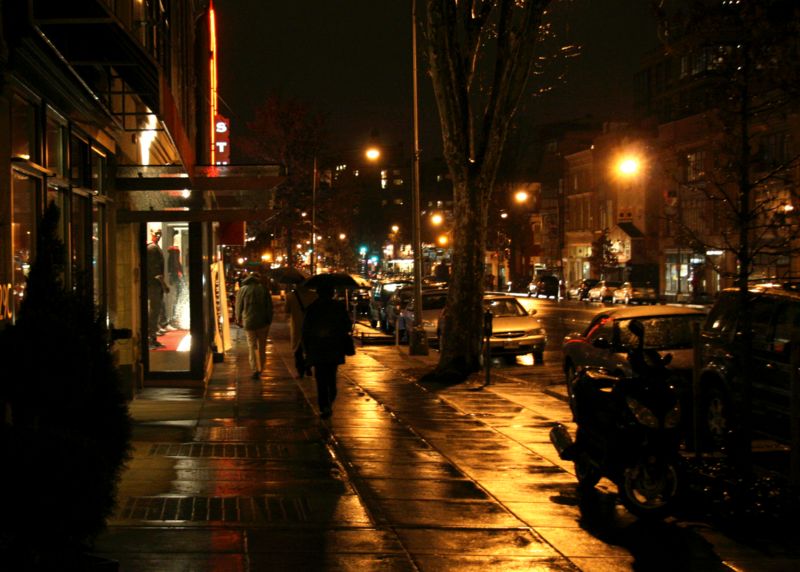 Becton then left the Post in 2003 to co-run Crooked Beat Records in Adams Morgan. He had collected records for years and most of his extra income went towards them, so it was a logical move for him. Then Becton left Crooked Beat after three years to do his own thing. “I always dreamed of owning my own record store. I started telling friends I was going to open a shop and after telling enough of them, I had to go ahead and do it.” He opened Som Records in the downstairs space at 1843 14th Street NW in 2006–on a rapidly changing block just south of T Street near Café Saint-Ex. Becton sells new and used vinyl LP’s and the store carries “super rare jazz records to dollar-bin 80s rock and everything in between.” He sells a few CDs, but more than 95% of the stock is vinyl. The Memorial to Durval Martins on the park fence at 11th and Q Streets NW. The memorial to Durval Martins remains at 11th and Q NW, where he was murdered on December 16, 2008. The police have no leads into his death and there is a $50,000 reward for information on the case. Mid City Artists have an open house today from 1 to 4 p.m. at Coldwell Banker Art 17 at 1606 17th Street NW. The exhibit is “Friend Request: 12 Members invite 12 Friends” and runs through January 29. “Friend Request” includes work by Sondra N. Arkin, Chuck Baxter, James Cassell, Robert Dodge, Thomas Drymon, Bill Harris, Harriet Lesser, Charlie Jones, Doris Kennedy, Bridget Sue Lambert, Lucinda Murphy, Juan Palomo, Mark Parascandola, Zade Ramsey, Ron Riley, Fabian H. Rios Rubino, Deborah Saks, Nikolas Schiller, Nicolas Shi, George Smith-Shomari, Clara de Soto, Isabelle Spicer, Trish Tillman, Ellyn Weiss. The benefit event at Policy was last night, but you can still donate to the United for Haiti benefit for Partners in Health. Proceeds help victims of the recent Haiti earthquake..
Why? 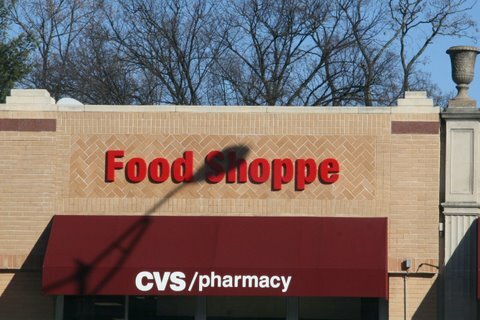 The use of Middle English in this “Food Shoppe” sign at the CVS in Cleveland Park is designed to… do what exactly? In our series of occasional Why postings, we bring you the “Food Shoppe” at the CVS on Connecticut Avenue in Cleveland Park. We happened upon this commercial and language abuse on a recent Saturday. For the first half of January, the number of robberies in the Borderstan area is about par while the number of stolen autos (nine) seems quite high. Two things stand out on the robberies: three on January 7 on 16th/17th/S Streets, all in the same general area; and two more robberies on T Street, one on 9th and one on 13th Street. U Street’s Local 16 and a local charity group, Do Good, Feel Good DC (DGFG), will host “Friday for Haiti” to benefit Oxfam America’s Haitian Earthquake Response Fund. Time is 6:30 to 10:30 p.m. this Friday, January 22, at 1602 U Street NW. All of your $25 donation and 10 percent of the evening’s bar proceeds will go to Oxfam America. In addition to helping Haiti, your $25 donation will get you free beer until 8pm, or until the kegs run out… $5 and $7 specialty cocktails… free food buffet featuring appetizers from the chef. You can still donate even if you cannot attend the Friday fundraiser at Local 16; go to the Oxfam fundraising page to make a donation. More information is available at the event’s Facebook page, the Oxfam donation page and the DGFG web page. 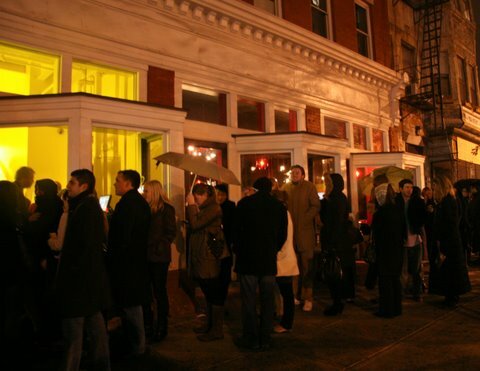 Several hundred Loganites lined up tonight for free pizzas at the HomeMade Pizza store at 14th and Church NW. It was the first of two nights of a soft opening for the chain store. The official or “hard” opening is Thursday afternoon. According to Eric Fosse, founder and CEO, HomeMade Pizza gave away about 250 medium-sized pizzas tonight. “Word of mouth is the best advertisement,” Fosse said. The store will be giving out free pizzas again Wednesday from 4 to 7 p.m. Located at the northwest corner of 14th and Church, the store is next to the soon-to-open Cork and Fork. HomeMade Pizza specializes in ready-to-bake pizzas for home. This week Mary Burgan reviews movies with operatic themes. Mary the Borderstan Movie Fan reviews movies with an operatic theme or twist. Her column runs every two weeks and previous reviews are at the bottom of this column. Two Saturdays ago, I went to a movie house to view the live HD broadcast of Richard Strauss’s bittersweet opera Der Rosenkavalier from the Metropolitan Opera. In addition, I went to Carmen last Saturday. I had to book tickets for both performances at a theater way out of town. All the theaters within Metro distance were sold out–not only for the Saturday matinee, but for the later “encore” Wednesday evening! Note: Tickets for the last three operas of this season will sell out quickly, so hurry to find a seat.